The Ain’t Rights are a punk band with the best intentions. They will do whatever it takes to make it, short of selling out. Because selling out is bad. But no selling out means 2 minute noodles, sleeping in vans and countless gigs to eleven people which net the band $35. It is in the immediate aftermath of one such gig in an out of the way club with a disturbingly Neo-Nazi vibe that the band unwittingly witness a murder. While they are punks The Ain’t Rights aren’t ‘punks’, and after refusing to play ball with the surly skinheads who demand they turn a blind eye, the band retreats to the green room to ponder their next move, while the skinheads outside ponder theirs. 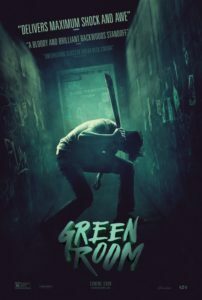 While Green Room is perhaps familiar in subject matter to some other horror thriller combos, about thirty minutes in the film sets a tone in a way that surprised me twice; once as it happened, and immediately again as I realised I just gasped audibly and unwillingly on my couch – something I can’t recall happening since all time slowed in Looper a few years ago. Then, within a few minutes of the stakes being made clear, they are raised, and while the film doesn’t again manage to elevate further, it still maintains a pretty damn high standard for a grisly, gory and compelling ninety odd minutes. Green Room is a film like the glitz-free punk band that it follows; lacking in flair but totally willing to ‘go there’. And like the best it will leave you with your pulse pounding and the knowledge that for a short while you were moved. It isn’t a great film and I likely won’t watch it again for a year or so, because I think it will be a film that will dull with repetition, but it is the film I have been name-dropping for a couple weeks now, and that likely won’t change for a while. Final Rating – 8 / 10. Must preface this by saying the impact is more on the first viewing, but you can’t rewatch a film until you see it once. This deserves to be seen at least once.